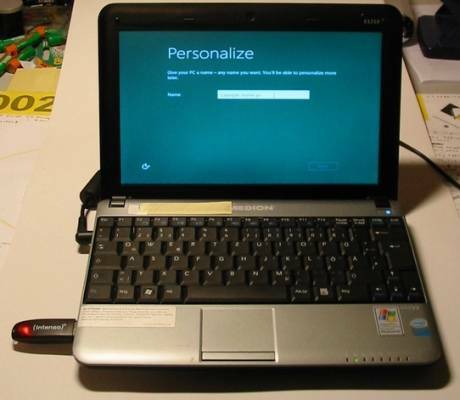 We’ve already looked at how you can use a USB flash drive to install Windows 8. All you need is an 8GB or larger flash drive, the Windows 8 disc image, and the Windows 7 USB/DVD tool. But there’s also a new feature in Windows 8 that lets you run the operating system from a USB flash drive. It’s called Windows To Go, and it works sort of like a Linux LiveCD. You can load the operating system onto a flash drive, plug it into any compatible computer, and boot from the USB drive instead of the hard drive or solid state disk. Unlike most LiveCDs though, Windows To Go can be configured with all of your apps, documents, and other settings. The feature is aimed at enterprise users, and the ability to create bootable USB drives will be included with Windows 8 Server. But Born city has step-by-step instructions for creating your own Windows To Go setup using a USB flash drive and the recently released Windows 8 Developer Preview. It’s not clear if this method will continue to work once Microsoft officially launches Windows 8 and starts charging for software. My guess is that it won’t, if for no other reason than that you’ll need a license to run Windows. Right now the developer preview is available license-free. You’ll need a 16GB or larger USB flash drive or hard drive, and the Windows 8 disc image and Windows Automated Installation Kit in order to create a Windows To Go device. For best results you’ll probably want a USB 3.0 disk with 32GB or more of storage capacity though. Make sure to visit Born City for the rest of the instructions. If you just want to see how Windows To Go works though, you can check out the video below, courtesy of ExtremeTech. That looks like a //BUILD stick?